Brave Phone is a non-governmental, non-profit organization established in 1997. Society in accordance with the best interests and needs of each child. Brave Phone responses to the need for safety and security of each and every child. Brave Phone enables the voices of children to be heard and systematically works to prevent cruelty and injustice to children. In its work, Brave phone is guided by the principle of expertise and availability. All services are free to users, developed based on results of scientific research. and are featured by distribution of free educational materials. In 15 years, Brave Phone responded to over 120,000 calls of children, parents and professionals, involved more than 700 volunteers and mental health professionals in direct work with children and parents, and organized series of trainings and supervision. Also, Brave phone is actively engaged in research work, democratization and development of a civil society and expansion of the helpline network, both in Croatia and abroad. Brave phone for children exists since 1997. Today, there are 70 active volunteers who are psychology, social work or social pedagogy students, trained for phone counselling to help children and parents. They are obliged to participate in professional supervision. Organization, all together, has 140 active volunteers engaged in its work at this point. When to call Brave Phone for Children? Since April 2013., Brave phone for Children has a European harmonized number 116 111 – the number for child helplines in Europe, established by advocacy of Child Helpline International members who wanted a unique, short, memorable toll-free number for all children in Europe. 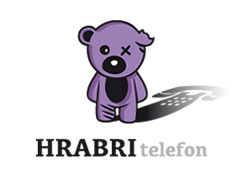 Brave Phone for Children has two parallel lines -in April 2013. the second line was activated to reduce the number of missed calls of children who try to contact Brave Phone. 91.3% of children in Croatia know what is Brave phone (BECAN, 2012). PARENTS NEED A SUPPORT TOO! What is a Brave Phone for Moms & Dads? Since the Brave Phone was founded, parents made a significant proportion in total number of clients on helpline, as well as on all other counselling services. Many of the parents and other adults concerned about s child were not sure whether to contact us or not, or the line was reserved for children brave calls only. That’s why, in April 2013, we opened a separate helpline – Brave phone for Moms & Dads (and other adults concerned about a child) – 0800 0800, and we confirmed to parents that we are here for them as well as for the children. This is the first professional, free of charge parentline in Croatia, which provides counselling help and support for parents from time they become parents until their children become adults. Description: free of charge counseling services for children, parents and other adults concerned about a child, regarding problems of family dynamics, school problems and child’s developmental problems (learning difficulties, self-esteem, developing social skills, etc.). Description: free of charge; creative & socialization workshops for children (4-14 years), and individual learning assistance and linguistic assistance for children (7-18 years). Description: Members of the Brave Phone’s children’s committee learn about child’s rights and responsibilities, visit institutions and professionals responsible for child protection, advocate their interests and propose changes… All children who wish to participate in their work and fight for children’s rights in Croatia are welcome to contact us! Do you know you have rights? Do you know there is the Convention on the Rights of the Child? Your rights are what you may do and what those who are responsible for you must do so that you can be happy, healthy and safe. You also have responsibilities towards other children and adults so that they have their rights granted.